20/03/15 -- Soycomplex: Beans closed with decent double digit gains, helped by the sharply weaker US dollar. Short-covering looks like it may have been a feature today, with the latest Commitment of Traders report showing managed money having added more than 22k lots to their short for the week through to Tuesday night. That took their overall short position to almost 40k contracts. Informa Economics trimmed their estimate for US soybean plantings this year by a little over 0.5 million acres. The number offered today was 87.5 million, which is very close to Farm Futures Magazine's 87.3 million estimate from earlier in the week. It would also be a record area, and up 3.8 million on last year. In percentage terms, corn rose more than beans today (up more than 3% in corn versus a rise of "only" 1.2% for beans). Based on tonight's market closes, the new crop soybean:corn price ratio is down below 2.34:1 versus 2.4:1 at the beginning of the week. The Buenos Aires Grain Exchange said that the very early soybean harvest in Argentina is now underway, and that first yields are above average. They were unchanged on their production estimate at 57 MMT. Others are as high as 60 MMT. Either would be a record. Brazil's harvest is now said to be around 60% complete. Dr Cordonnier says that the number of vessels scheduled to arrive in Brazil by the end of April to load soybeans is 141, up from 123 a week ago and versus 122 this time last year. The total volume set to load by the end of April is 8.5 MMT, he adds. Very favourable soybean yields have been reported in Southern Brazil, which has been wet throughout the growing season. "Parana producers reported 50 bushels per acre as the harvest has advanced. This would be 15% higher than the soybean yield last year, which was damaged by a severe midsummer drought. Rio Grande do Sul soybean yields were exceptionally favourable with 43.5 bushels per acre, setting a new record," said Martell Crop Projections. May 15 Soybeans closed at $9.73 3/4, up 12 cents; Jul 15 Soybeans closed at $9.78, up 11 1/4 cents; May 15 Soybean Meal closed at $324.00, up $4.70; May 15 Soybean Oil closed at 30.68, up 6 points. For the week that puts front month beans up 5 1/2 cents, with meal down $14 and oil up 49 points as meal becomes the weakest leg of the complex. Corn: The corn market also closed with double digit gains. The US dollar, which dumped on Wednesday following the Fed announcement that indicated an interest rate rise wasn't on the cards this year, appeared to have found its feet again yesterday. All that changed again today however, with the US currency back under pressure, which was supportive for the entire US grains complex. As with soybeans, Informa lowered their 2015 US corn planting estimate slightly from their previous forecast, and at 88.5 million acres they are again very close to the figure offered up by Farm Futures Magazine earlier in the week (88.34 million acres). Plantings were 90.6 million acres in 2014, so Informa's number is a fairly modest 2.3% decline versus a year ago. Informa pegged US 2015 sorghum plantings at 8.2 million acres, up 600,000 from their previous forecast and more than 1 million (or 15%) up on last year. Short-covering was most like also a feature in the US corn market today, with the latest Commitment of Traders report showing that managed money added nearly 70k contracts to their shorts in the week through to Tuesday night, flipping them from a net long to a net short of 37k contracts. Fund buying was estimated at around a net 12,000 contracts today. The Buenos Aires Grain Exchange said that the Argentine corn harvest had advanced to 5.6% done, up from 3.4% a week ago and better than 2.2% complete this time last year. They held steady with their production estimate at 22.5 MMT, a 16.5% fall versus a year ago. South Africa are said to be importing corn for the first time in almost a year after the worst drought since 1992 slashed corn production by around a third. Output this year will be no greater than 9.66 MMT say CEC. Three shipments of 30,000 MT each of yellow corn from Argentina are currently said to be en route to Cape Town destined for animal feed. The local price of white corn, a human food staple, has meanwhile already risen 27 percent in Johannesburg this year, said one analyst. May 15 Corn closed at $3.85, up 11 1/2 cents; Jul 15 Corn closed at $3.92 3/4, up 11 1/4 cents. For the week May 15 corn was up 11 cents. 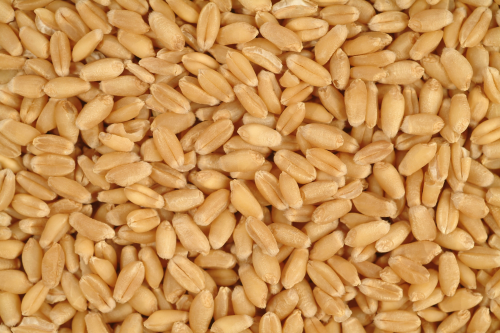 Wheat: The wheat market closed with strong gains on the day, and for the week, across all three exchanges. Talk of significant winterkill damage to US winter wheat in Western Nebraska, Central Kansas, Eastern Colorado and North Oklahoma is rife. That seems to be enough to encourage fund money to exit some of their sizeable short positions in wheat, even if rising prices will hardly foster additional export interest for US wheat. This damage was probably caused by a sudden dip well below freezing around Nov 12, it is thought. Dryness on the Southern Plains also remains an issue, and what recent rain has fallen has been generally light (1/4 inches) and scattered. Today's weaker US dollar was another a supportive feature, helping May 15 Chicago wheat to close above its 50-day moving average for the first time since Jan 7. Wheat futures in Paris closed at their best levels in nearly two months tonight, adding a bit more support. Informa estimated US all wheat plantings at 56 million acres for the 2015 harvest. This was 1 million more than they estimated in January. Plantings for 2014 were 56.82 million, so this would still be a decline of 1.4% year-on-year. Ukraine said that they'd exported 26.13 MMT of grains so far this season, including 9.55 MMT of wheat, more than 4 MMT of barley and 12.31 MMT of corn. Early spring grain planting in Ukraine (mostly barley) is now said to be 16% complete. The Chinese government sold less than 10% of the US HRW wheat offered up at auction today. They are proposing to sell off Australian origin wheat held in state reserves next week. China will start harvesting it's 2015 winter wheat crop next month. Current crop conditions appear favourable in Henan, the leading province which produces around 23% of the nation's crop, but rather poor in the second largest region of Shandong (where 19% of China's wheat crop is grown) and also in the fourth highest producing province of Hebei (which accounts for 10% of nation production), say Martell Crop Projections. May 15 CBOT Wheat closed at $5.30, up 18 cents; May 15 KCBT Wheat closed at $5.69 1/2, up 19 1/4 cents; May 15 MGEX Wheat closed at $5.88 3/4, up 16 cents. For the week overall that puts Chicago wheat 21 1/4 cents higher, with Kansas wheat adding 27 3/4 cents and Minneapolis gaining 34 1/4 cents. 20/03/15 -- EU grains closed mostly higher on the day and for the week, with wheat in particular managing some pretty decent gains on the back on continued robust exports. At the finish, Mar 15 London wheat was up GBP1.85/tonne at GBP123.40/tonne; May 15 Paris wheat was EUR2.25/tonne higher at EUR196.75/tonne; Jun 15 Paris corn was EUR0.25/tonne firmer at EUR163.75/tonne; May 15 Paris rapeseed was also up EUR0.25/tonne at EUR371.25/tonne. This was London wheat's best close in more than a month, and the highest for Paris wheat in almost two. For the week, London wheat advanced GBP5.60/tonne, Paris wheat gained EUR6.50/tonne, rapeseed added EUR2.25/tonne, but corn fell EUR0.50/tonne. So much for the HGCA's theory that London wheat is following Paris corn more closely than the French wheat market. EU soft wheat exports are now running at 8% above year ago (record) levels, based on last night's latest figures from Brussels. Although the USDA have been raising their forecasts for EU wheat exports in recent WASDE reports, they currently still have them to fall 1.3% this season. The USDA's current EU-28 "all wheat" export estimate is 31.5 MMT, which also includes durum and wheat flour exports. According to the EU Commission, export licences so far this season stand at 23.7 MMT of wheat, 562 TMT of wheat flour and 782 TMT of durum, which all adds up to a fraction over 25 MMT with 14 weeks of 2014/15 left to run. Based on the USDA full season estimate, that leaves 6.5 MMT to export between now and the end of June. Yet Brussels has granted almost 2.5 MMT worth of export licences for soft wheat, durum and wheat flour in the past two weeks alone. EU barley exports have also been brisk this season. The USDA currently pegs those at 7.5 MMT, versus the more than 6.5 MMT that's already been authorised for export. EU barley exports so far this season have averaged 172 TMT/week. If they were to continue at that pace, then that would add a further 2.4 MMT to the full season total, which would then beat the USDA forecast by 1.4 MMT. In Ukraine, the Ag Ministry say that early spring grains (which excludes corn) have been planted on 401,000 ha, or 16% of the planned area. Most of this is spring barley (287,000 ha). Corn planting in Ukraine usually takes place in April and May. APK Inform say that the big production increase that the country has seen over the last decade has largely been due to better yields due to the wider use of imported hybrid seed. In 2005, when national yields averaged 3.74 MT/ha, Ukraine imported 21% of its corn seed needs. By last year that had more than doubled, to around 43% of the corn planted in Ukraine coming from imported seed - yields in 2014 averaged 6.11 MT/ha. It will be very interesting therefore this year to see if the proportion of imported seed drops, and by how much, given the various problems that the country currently has (weak currency, lack of easily available credit etc). If it does fall then we should expect to see a correlating decline in yields, unless the weather is particularly kind. There was no weekly update on French crop conditions from FranceAgriMer today due to "technical problems". 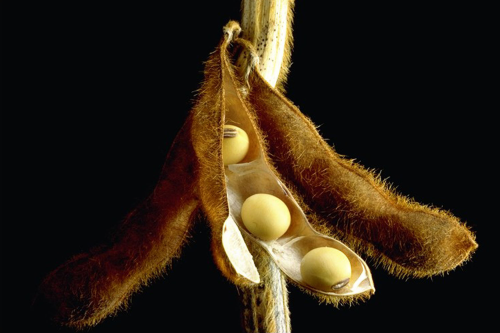 19/03/15 -- Soycomplex: Beans closed lower after the US dollar regained its composure following yesterday's fall when the Fed indicated that interest rates looked set to stay on hold a while longer yet. Weekly old crop export sales of 342,000 MT were up noticeably from the previous week, even if down 13 percent from the prior 4-week average. There were also new crop sales of 142,900 MT. Actual exports themselves were 488,900 MT, with China (272,400 MT) the leading destination. Total shipments plus outstanding sales now total 99% of the USDA forecast for the season. Lanworth were said to have estimated the Brazilian crop at a record 94.4 MMT and the Argentine crop at a record 60 MMT. MDA CropCast aren't quite so bullish, even if both of their estimates are also all time highs. They go for 94.34 MMT in Brazil and 56.12 MMT in Argentina, both unchanged from a week ago. They also gave us some numbers for 2015/16 production, putting Brazil slightly lower than this year at 93.95 MMT and Argentina likewise at 55.55 MMT. In the US they estimate the 2015 soybean harvested area at 33.78 million ha (83.4 million acres), up 1.1% from 33.40 million ha (82.5 million acres) last year. They see yields at the equivalent of 47 bu/acre, down a bushel/acre from last year and production at 106.71 MMT versus 107.99 MMT in 2014. They put the world 2015/16 soybean crop at 300.66 MMT, little changed from 301.15 MMT this season. The global rapeseed crop is also predicted to fall a little, down from 64.97 MMT to 64.07 MMT. Societe Generale estimated the 2015 US soybean planted area at 83.1 million acres, well below the 87.3 million predicted by Farm Futures Magazine earlier in the week. Informa are due to release their estimates tomorrow. SocGen forecast soybean prices in the range of $9.50 to $10.50 over the next 12 months. May 15 Soybeans closed at $9.61 3/4, down 3 1/4 cents; Jul 15 Soybeans closed at $9.66 3/4, down 3 cents; May 15 Soybean Meal closed at $319.30, down $1.50; May 15 Soybean Oil closed at 30.62, down one point. Corn: The corn market closed around a cent lower, failing to hold onto early gains as the US dollar recovered some of yesterday's losses. Weekly export sales of 502,300 MT for 2014/15 were up 20 percent from the previous week, but down 31 percent from the prior 4-week average. There were also net sales of 64,800 MT for 2015/16. Pre-report trade estimates were for combined sales of 400-650 TMT, so these figures were in line with expectations. Exports themselves were 692,700 MT, down 41 percent from the previous week and 33 percent below the prior 4-week average. Cumulative shipments plus outstanding sales are at 80% of the USDA target for the season versus 74% typically at this time. MDA CropCast estimated Brazil's 2014/15 corn crop unchanged from a week ago at 76.9 MMT and also went unchanged on Argentina at 23.6 MMT. They forecast Brazil's 2015/16 corn crop at 74.1 MMT and Argentina's at 23.7 MMT. In the US they predict a 2015 corn harvested area of 33.5 million ha, which is 82.75 million acres, down from 33.7 million ha, or 83.2 million acres, a year ago. They see corn yields this year averaging 170 bu/acre versus the record 172.7 bu/acre set a year ago. That puts US production at 356.6 MMT in 2015, down 2.3% on last year's 364.9 MMT. On a world level they have the global 2015/16 corn crop at 961.2 MMT versus 973.4 MMT this season. The fact that US corn yields have declined sharply in the year following each of the last four record yielding years since 1990 is getting some airtime. The theory attached to it goes that due to low prices following a bumper production year, US growers will cut back on area, seeding rates and inputs in an effort to reduce costs. Yields subsequently suffer in the year following records being set. Whether this all happens again in 2015 remains to be seen. The balance of probability would however suggest that the US weather is unlikely to be quite so co-operative again this year, and thus reduced yields versus last season's record are more likely than not. With plantings also expected to be reduced, then US production in 2015 should be lower, all things considered. SocGen said that they are neutral on US corn prices. They predict plantings of 89.7 million acres this year, which is more than most. May 15 Corn closed at $3.73 1/2, down 1 1/4 cents; Jul 15 Corn closed at $3.81 1/2, down 1 1/4 cents. Wheat: The wheat market closed mixed, but mostly lower. Weekly export sales of 391,900 MT for delivery in the 2014/15 marketing year were down 12 percent from the previous week, but up 4 percent from the prior 4-week average. There were also sales of 142,900 MT for 2015/16. Trade estimates had been for sales in the range of 300-650 TMT, so these numbers were in line with expectations. Exports of 488,900 MT were up 14 percent from the previous week and 9 percent above the prior 4-week average. Total exports plus outstanding sales now total 92% of the USDA's target for the season. Talk of some rain falling in parts of Kansas took the edge off the southern Plains drought story that has supported the market in recent days. The stronger dollar again has the US market wondering where the next export order is coming from. Europe continues to pick up the lion's share of international wheat business, with another 780,000 MT of soft wheat export licences this past week - significantly more than the US managed to achieve once again. SocGen forecast US wheat prices to fall below $5/bu in the next 12 months, saying that exports are consistently falling "well short of expectations". MDA CropCast forecast the world 2015/16 wheat crop at 716.7 MMT, down almost 3 MMT on this season, but still a strong total. They see US all wheat production at 59.6 MMT this year, up 6.4% versus 56 MMT last year. Russia's 2015 wheat crop is estimated at 53.9 MMT, down 7.2%. Ukraine's is seen down 4.5% at 23.3 MMT. Europe's will fall 2% to 147.08 MMT, they added. The USDA's FAS in Japan said that the country had imported 3.2 MMT of wheat in the first 7 months of this season, with the US the largest supplier (at 1.7 MMT), followed by Canada at 0.9 MMT and Australia with 0.5 MMT. They predict Japan's wheat imports to fall 0.3 MMT to 5.8 MMT this season, and hold steady at that level in 2015/16. Lower feed wheat demand due to increased corn utilisation in feed is behind the drop, they said. Reuters reported than China had bought 300 TMT of Canadian and 150 TMT of Australian wheat in recent days. Syria are tendering for 150 TMT of optional origin milling wheat. May 15 CBOT Wheat closed at $5.12, up 1 1/4 cents; May 15 KCBT Wheat closed at $5.50 1/4, down 2 3/4 cents; May 15 MGEX Wheat closed at $5.72 3/4, down 5 1/4 cents. 19/03/15 -- EU grains closed mostly higher, as the dollar reverted to type following what the HGCA say was its biggest one day fall in six years yesterday. The pound and euro both fell around a cent or more against the US currency today compared to last night's closes. At the finish, Mar 15 London wheat was GBP1.80/tonne firmer at GBP121.25/tonne, May 15 Paris wheat was up EUR2.25/tonne at EUR194.50/tonne, Jun 15 Paris corn fell EUR0.25/tonne to EUR163.50/tonne and May 15 Paris rapeseed rose EUR0.75/tonne to EUR371.00/tonne. For Paris wheat this was a near 8-week closing high for a front month. Strong exports again provided support, with Brussels announcing a further 780,000 MT of soft wheat export licences this past week. That takes the season to date total now to 23.7 MMT, widening the gap between this season and the last. The 2014/15 to date total is now 8% up on a year ago, and you won't need me to remind you again that last season saw a record volume of wheat exported by the EU, a feat which was generally not expected to be bettered this time round. Yet here we are, 8% ahead of a year ago, and with the gap between then and now widening. The euro was trading at close to 1.40 versus the US dollar 12 months ago. Tonight it closed below 1.07 for a year-on-year fall of more than 23%. Various trade estimates for crop production in 2015/16 are now starting to filter through, with most predicting a decline in world wheat and corn output in the season ahead, although not by that much. Current season carryover stocks look set to remain high though, depressing values for next season, without a serious weather problem emerging from somewhere. 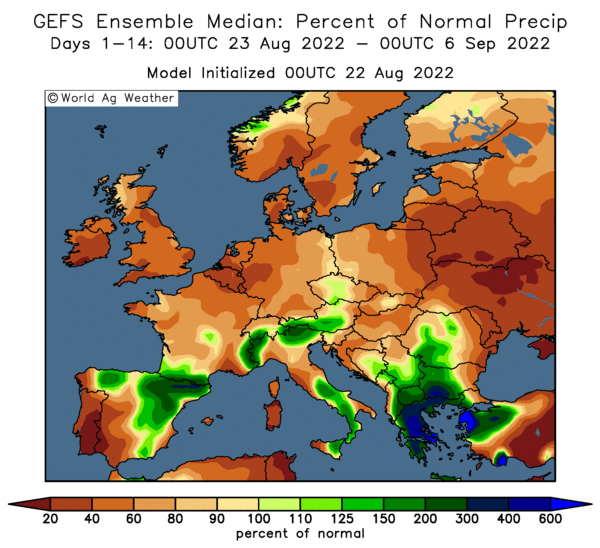 They increased their forecast for the EU-28 all wheat crop for the year ahead by 400 TMT from last week to 147.08 MMT, a modest 2% decline versus 2014/15. 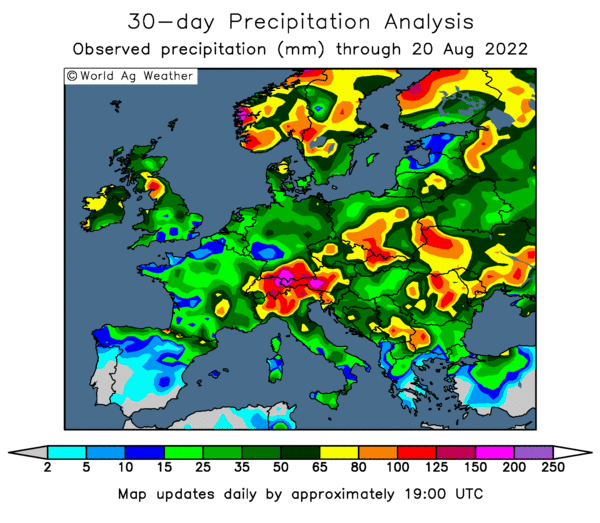 That's slightly higher than Copa Cogeca's recent 146.2 MMT forecast. MDA estimate EU wheat yields to average 5.67 MT/ha versus 5.86 MT/ha a year ago and Copa Cogeca's 5.64 MT/ha forecast. MDA estimated the EU-28 OSR crop down 90,000 MT from last week to 21.09 MMT, which is a 7.8% fall compared with last year, due to reduced plantings, lower anticipated yields and also noting dryness building in Germany, Poland and the Czech Republic. They see the EU-28 barley crop unchanged on a year ago at 57 MMT. Reuters put some flesh on the bones of yesterday's rumoured 400-500 TMT of high protein wheat purchases said to have been made by China, saying that they bought 300 TMT of Canadian and 150 TMT of Australian origin material. Syria announced a tender for 150 TMT of optional origin milling wheat today. Russia said that spring grain plantings were off to an earlier than normal start, with 471,000 ha sown so far. Although that's less than 1% of the intended area, it compares favourably with only 102,500 ha this time a year ago. Russian grain stocks as of Mar 1 were up 15% versus a year ago at 26.1 MMT, according to Rosstat. Ukraine said that their early spring grain planting (which doesn't include crops like corn) was 14% complete on 343k ha. Winter grains have had fertiliser applied on 72% of the planted area, and 74% in the case of winter OSR, said the Ukraine Ag Ministry. In other news, there's been some interesting debate going around concerning US corn plantings and yield prospects this year - before virtually any of this year's crop has even got into the ground (save for Texas). Whilst just about everyone expects corn plantings to fall, the general consensus is that they won't drop by that much. Farm Futures Magazine yesterday estimated the 2015 US corn area at 88.34 million acres, down by 2.3 million (or 2.5%) compared to last year. Societe Generale today suggested an area of 89.7 million acres, only 1% less than a year ago. The most interesting part of the debate concerns yield potential. With several analysts noting that yields have fallen sharply (by at least 7% and in one case by more than 18%) in each of the four big corn record yield years since 1990. One theory doing the rounds is that these bumper production years have subsequently been met by a slump in prices, thus encouraging US growers to reduce their planted area, and cut seeding rates, plus apply less fertiliser and agrochemicals the following year in an effort to save money. Hence, yields are usually significantly lower the season after a bumper US corn crop. Throw in the likelihood that a year with near ideal growing conditions such as 2014 is unlikely to be followed by another as equally benign, and the argument gains a bit of further traction. 18/03/15 -- Soycomplex: Beans closed around 10 cents higher in a rebound from recent losses. May 15 beans opened near Tuesday’s low of $9.53 1/2 but edged higher after that level held. Yesterday's close of $9.54 1/2 was the lowest close for a front month since October, and took out the oft-seen early February low of $9.59 1/2 set on Feb 2. A Fed statement, which appeared to indicate that a US interest rate rise wasn't likely to be on the cards this year, sent the dollar tumbling from recent highs. It may also have encouraged a bit of spec money to come back into commodities, some are saying. Both will have helped the entire grains sector today. Oil World estimated the Brazilian soybean crop at 93.8 MMT, which is in line with other trade forecasts. Dr Cordonnier was unchanged on his forecast for Brazil at 93 MMT. Bear in mind of course that any rise in soybean prices is friendly for US spring plantings. Farm Futures Magazine estimated these at a record 87.3 million acres in 2015, up 3.6 million from the previous year. It is however not as high as was thought likely earlier in the year. The US soybean:corn price ratio on new crop is less than 2.4:1 tonight versus 2.7:1 last August. Informa are due to release their US acreage numbers on Friday, before we get the USDA themselves on Mar 31. I can find no "official" trade estimates for tomorrow's weekly export sales report, but I'd expect that for beans the market is looking in the region of 250-300 TMT as demand switched to Brazil. May 15 Soybeans closed at $9.65, up 10 1/2 cents; Jul 15 Soybeans closed at $9.69 3/4, up 10 1/4 cents; May 15 Soybean Meal closed at $320.80, up $3.30; May 15 Soybean Oil closed at 30.63, up 59 points. Corn: The corn market ended the best part of 4 cents higher, recovering around half of yesterday's losses. Futures traded higher following the decline of the US dollar following the FED's monetary policy statement. That indicated that US interest rate hikes will likely be at a slower pace than previously thought due to the more moderating growth in the US economy seen recently. Farm Futures Magazine estimated the 2015 US corn area at 88.34 million acres, down from 88.5 in their previous survey and 2.3 million below last year. Interestingly, new popular kid on the block sorghum is seen having its planted area increased 18% to 8.4 million acres. The Rosario Exchange estimated the Argentine corn crop at 23.5 MMT. South Korea's KOCOPIA bought 54,000 MT of corn, and the country's KFA were said to have bought around 60,000 MT of corn in tender. Both purchases were said to have been of optional origin, but most likely will end up being sourced from Brazil. Some trade reports suggest that Brazilian corn is possibly even working its way into the SE of the US. There are also reports of Brazilian ethanol heading to the US, helped by low freight rates and the weak Brazilian real. The US Energy Dept reported weekly US ethanol production up to 947,000 barrels/day this past week versus 944,000 bpd the previous week and 931,000 bpd the week before that. It is also better than the 891,00 bpd produced this week a year ago. Stocks were reported at 20.820 million barrels, which is 353,000 barrels lower than last week. Stocks have now fallen three weeks in a row. I'd expect the market to be looking for weekly corn export sales of around 500-700 TMT tomorrow. May 15 Corn closed at $3.74 3/4, up 3 3/4 cents; Jul 15 Corn closed at $3.82 3/4, up 3 3/4 cents. Wheat: The wheat market closed around 7-10 cents higher, benefiting from the weaker US dollar, even if it's far too soon to see that being translated into increased US exports. There's still talk of significant winterkill damage to wheat in parts of Kansas and Nebraska. There's also chatter of dryness issues in Kansas and Oklahoma in particular. In Kansas, the leading US wheat state, dry conditions have stressed wheat leading to a rather mediocre crop rated only 41% good-excellent, 46% fair and 13% poor-very poor, said Martell Crop Projections. Things are even worse in Oklahoma - the driest of the 3 main bread wheat states. "Producers reported that subsoil moisture was 70% short-very short, 29% adequate and only 1% surplus. Rainfall is needed soon to preserve chances for a favourable yield. Jointing, the rapid vertical growth stage that demands generous rainfall, was already 19% underway in mid March," they note. These worries come as fund money is sitting on a sizeable short position in wheat. In other news, Farm Futures Magazine estimated the 2015 US all wheat area at 55.6 million acres, down from their 57.6 million estimate in January. Spring wheat plantings were forecast at 13.4 million. Media reports suggest that China has bought 400-500 TMT of high protein wheat from various sources in the past few days. Tomorrow's weekly export sales report will be of interest. Last week's sales were pretty good at 445,200 MT for delivery in the 2014/15 marketing year. That was up 21 percent from the prior 4-week average. Tomorrow I'd expect the trade to be hoping for something of a similar magnitude, but expecting maybe 300-400 TMT. May 15 CBOT Wheat closed at $5.10 3/4, up 7 1/4 cents; May 15 KCBT Wheat closed at $5.53, up 10 1/4 cents; May 15 MGEX Wheat closed at $5.78, up 8 1/4 cents. 18/03/15 -- EU grains closed mixed, although generally there was little change either way from yesterday. 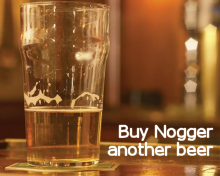 The day ended with Mar 15 London wheat down GBP0.10/tonne at GBP119.75/tonne, May 15 Paris wheat fell EUR0.75/tonne to EUR192.25/tonne, Jun 15 Paris corn dipped EUR1.00/tonne to EUR163.75/tonne and May 15 Paris rapeseed was up EUR1.00/tonne at EUR370.25/tonne. Yet again fresh news of any great note was scarce. Although soon to expire and tradeless Mar 15 London wheat officially closed slightly lower, the more active May 15 finished up GBP0.50/tonne at GBP121.75/tonne, and new crop Nov 15 was GBP0.80/tonne higher at GBP130.45/tonne. A near GBP9.00/tonne premium to carry old crop six months into new crop explains why many UK farmers remain relatively relaxed about the substantial volume of last year's harvest that they are still sitting on. The HGCA said that nearby UK wheat prices were following the French corn market much more closely at the moment than they are mimicking French wheat. "For new crop, on the other hand, movements have been much more in line with other wheat markets," they noted. There was some support for London wheat today from a weaker sterling/euro, following the release of the Bank of England's MPC minutes of their March meeting showing a unanimous vote to keep interest rates on hold at 0.5%. The Committee said that whilst they do expect interest rates to rise, the time scale mentioned was only "over the next three years" - which hardly sounds like an increase is just around the corner. So the pound traded a bit lower versus the euro, which in theory will help UK wheat become a bit more competitive on the export front. That's something that it certainly needs to be. Reuters reported that German wheat exports could hit as much as 1.0 MMT in March. To put that into perspective Germany only exported 3.9 MMT of wheat in the whole of last season, including just 360,000 MT in March 2014. The Ukraine Ag Ministry said that growers there have 100% of their seed requirements for the spring sowing campaign already bought. They've also got 88% of their fertiliser needs contracted along with 73% of their fuel. The first thing that strikes me about that is "how do you know that?" The second thing being "you're making this up aren't you?" Followed by the fact that they need 100% of their fuel, not 73% of it, to carryout the required fieldwork. The Ministry said that they expect to formulate (make up) some early crop production forecasts by the end of the month. The Russian's are predictably not so shy. Their Ag Minister has already estimated this year's grain crop at 100 MMT (versus 105.3 MMT last year), but today said that because of the early start to the spring sowing campaign that this would probably be increased higher. 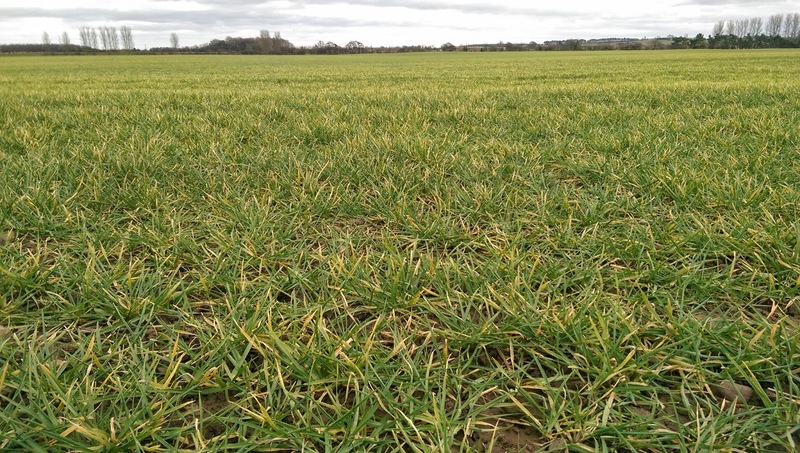 Crops emerging from winter dormancy in the south of the country are looking in better shape than expected, with winter losses therefore likely to be less than feared, he said. 17/03/15 -- Soycomplex: Beans closed lower, under pressure from the ongoing South American harvest, with funds selling an estimated net 8,000 contracts on the day - which is the equivalent of over 1 MMT. Front month May 15 beans closed within 5 cents of a slump below $9.50/bushel. These levels may not be setting US farmers' hearts racing, but the acute weakness of the Brazilian real relative to the US dollar still makes things reasonably attractive for the Brazilian grower. Corn fell too, in fact by more in percentage terms (down 2.1% versus a daily fall of 1.5% in soybeans), which won't help to make planting that any more attractive to the US grower than beans this spring. Attention is now starting to focus on the USDA's planting intentions report due Mar 31. May 15 Soybeans closed at $9.54 1/2, down 14 3/4 cents; Jul 15 Soybeans closed at $9.59 1/2, down 14 1/4 cents; May 15 Soybean Meal closed at $317.50, down $6.20; May 15 Soybean Oil closed at 30.04, down 35 points. Corn: The corn market closed sharply lower. Fresh news was generally lacking, and what was out there was bearish. "Generally speaking most commodities were lower on the day with corn setting the pace in the grains. Lack of supportive fundamentals and bearish news continues to mount," said Benson Quinn Commodities. Safras e Mercado reported that planting of the Brazilian safrinha corn crop was now 93% complete versus 85% a year ago. Reuters reported that China had bought more than 600 TMT of Ukraine corn since the beginning of the year. China continues to shy away from US corn due to GMO problems. 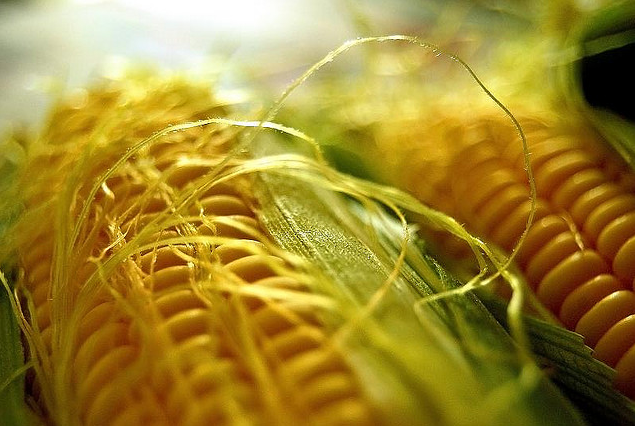 South Korea reportedly purchased 205 TMT of Brazilian corn for September shipment overnight. The weak Brazilian real/strong US dollar story is as bearish for corn as it is for soybeans, with corn offers out of Brazil very competitive compared to US corn on the Gulf. Ahead of the USDA's plantings report, Informa are due to release their acreage estimates on Friday. Before that, the US Energy Dept are out tomorrow with their latest ethanol production and stocks data. May 15 Corn closed at $3.71, down 8 cents; Jul 15 Corn closed at $3.79, also down 8 cents. Wheat: The wheat market closed lower, unable to hold onto overnight grains amid falling corn and soybeans. Early strength in wheat was probably tied to news that the proportion of Kansas winter wheat rated good to excellent fell from 46% to 41% during the past week. Oklahoma was down from 42% to 40% in the top two categories too. "Despite the wheat markets trading lower, there’s (still) reason to believe the trade is still wary of the net short fund position in the winter wheat markets," suggested Benson Quinn. They're probably right, but the downwards pull of soybeans and corn proved too much to resist, with funds selling an estimated net 3,000 Chicago wheat contracts on the day. There's a chance of limited light rains for the dry parts of the southern Plains, but a drought buster they won't be. The strength of the US dollar remains a problem for US wheat exports. The trade will therefore be hanging on every word from the Fed tomorrow, when it is due to release its latest statement concerning the US economy and maybe provide a clue to when US interest rates will start to rise. May 15 CBOT Wheat closed at $5.03 1/2, down 10 1/2 cents; May 15 KCBT Wheat closed at $5.42 3/4, down 12 1/4 cents; May 15 MGEX Wheat closed at $5.69 3/4, down 11 1/4 cents. 17/03/15 -- EU grains closed mixed, but wheat was mostly a little higher with Paris wheat closing at the best levels for a front month since late January. 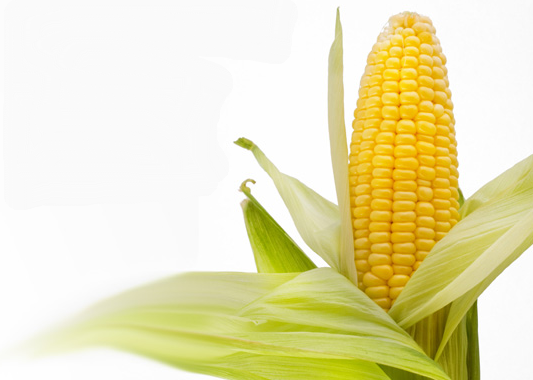 At the finish, Mar 15 London wheat was up GBP0.90/tonne at GBP119.85/tonne; May 15 Paris wheat was EUR0.25/tonne higher at EUR193.00/tonne; Jun 15 Paris corn was EUR0.25/tonne lower at EUR164.75/tonne; May 15 Paris rapeseed was EUR1.75/tonne easier at EUR369.25/tonne. Fresh news was relatively scarce. Strong exports, helped by the weak euro, continue to support the continental market. The HGCA said that the Scottish winter wheat area was up 2.3% (as of Dec 1) at almost 105k ha. Add that to their previous forecast of 1.69 million ha for England and Wales and we get a UK area of around 1.8 million ha (excluding Northern Ireland where very little is grown). That's around 100k ha down on last year, "meaning that the gap could potentially be filled by spring plantings,"they say. It's higher than Copa Cogeca's recent 1.687 million ha estimate, but lower than Origin's 1.95 million ha forecast. The HGCA went on to estimate the Scottish winter barley area at just over 55k ha, with the winter OSR area north of the border coming in at almost 36.5k ha. Those numbers take the total UK winter barley area to around 426k ha versus 421k ha a year ago. Winter OSR plantings are at almost 670k ha versus a total OSR area of 719k ha this time last year. In other news, Rusagrotrans forecast Russia's March grain exports at around 1.1 MMT, falling to 1 MMT in April, 725 TMT in May and 675 TMT in June. That equals 3.5 MMT over the entire period, and would take the nation's full season grain exports to around 28 MMT versus 25.3 MMT last season. Wheat will account for 20.4 MMT of this season's exports (73%), along with 5 MMT of barley (18%) and 2.3 MMT of corn (8%), they say. In 2013/14 Russia's wheat exports were 18.3 MMT, or 72% of total grain shipments, with barley accounting for 2.7 MMT (11%) and corn 4 MMT (16%), they added. Russian spring grain plantings are still at their fledgling stage at only 0.8% complete on an area of 295k ha, say the Ag Ministry. Ukraine spring grain plantings are 8% complete on 184k ha. Ukraine said that their Mar 1 grain stocks were 19.3 MMT, up 22% on a year ago. Wheat accounts for 6.2 MMT of that total, along with 1.6 MMT of barley and 10.7 MMT of corn, say their Ag Ministry. 16/03/15 -- Soycomplex: Beans closed a touch lower in low volume trade. There wasn't a huge amount of fresh news. Weekly export inspections came in at 583,944 MT, down from 625,713 MT last week and well below 950,885 MT a year ago. Cumulative shipments are still 4.2 MMT higher than a year ago though. The Feb NOPA crush came in at 146.97 million bushels, down from down from 162.7 million but up versus 141.6 million last February and a second highest ever volume for that particular short month. The South American harvest rumbles on, and they are now past halfway done in Brazil. Copa Cogeca pegged the EU 2015 rapeseed crop down nearly 7% on a year ago at a 3-year low of 21.95 MMT. 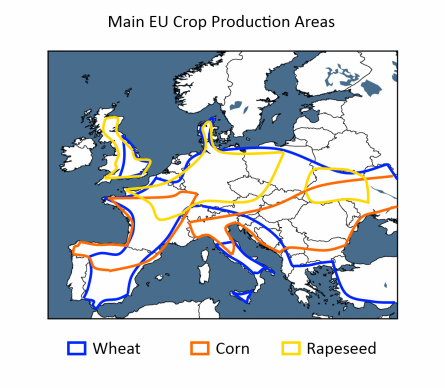 EU rapeseed consumption will total nearly 26 MMT in the current season, according to the USDA. That will mean increased imports nest season, although the nearest regular major supplier, Ukraine, will also have a reduced crop this year by the looks of things. That could mean more rapeseed being sought from farther afield, and possibly increased soybean demand as an alternative. May 15 Soybeans closed at $9.69 1/4, down 4 3/4 cents; Jul 15 Soybeans closed at $9.73 3/4, down 4 1/4 cents; May 15 Soybean Meal closed at $323.70, down $3.30; May 15 Soybean Oil closed at 30.39, down 10 points. Corn: The corn market closed with small losses in a "no news" sort of a day. Safrinha corn planting in Mato Grosso is said to be 89% complete, up from 76% a week ago. Weekly corn export inspections only came in at 735,311 MT, well below the 1.18 million MT from the previous week and also below the 976,742 MT for the same week last year. Sorghum export inspections were very strong, as that grain continues to find good buying interest from China as a corn alternative. Copa Cogeca estimated the EU-28 corn crop this year down 4.6% on a year ago at 68.92 MMT, although that would still be the second highest on record. Production in leading nation France is seen 6% lower at 15.9 MMT. Output from Europe's second largest producer, Romania, will slip 7% to 10.5 MMT, whilst third biggest nation, Hungary, will be around unchanged at 8.9 MMT. Ukraine said that they'd exported 25.65 MMT of grains so far this season, of which 12.05 MMT (47%) was corn. Russia said that they'd shipped out a very similar volume, 25.15 MMT, although the proportion of corn (at 1.65 MMT is only 6.6%) is much lower. Both countries are expected to major on corn exports for the remainder of the season. South Korea is tendering for 3 cargoes of optional origin corn for October shipment. May 15 Corn is at $3.79, down 1 1/2 cents; Jul 15 Corn is at $3.87, down 1 cent. Wheat: The wheat market closed higher, with double digit gains across the nears on all three exchanges, as weather concerns prompted short-covering. As we have seen before with the wheat market, once fund positions have built up a sizeable short, such as the one they have held recently, it sometimes doesn't take a lot to get them spooked into closing these out. 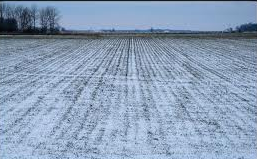 "Areas of significant winterkill are being reported from west-central, northwest and north-central Kansas, as well as southcentral Nebraska," said Arlan Suderman of Farm Futures Magazine. There are also said to be dryness issues on the US southern Plains. Support also came from fairly decent export inspections of 519,592 MT, up sharply from 376,210 MT the previous wee and also above the same week a year ago. Copa Cogeca estimated the 2015 EU-28 soft wheat crop down 6.5% year-on-year at 138.42 MMT. Whilst output in France is seen around unchanged levels (Friday's crop ratings there at 91% good to very good were the highest in 5 years), significantly lower production is expected from Germany (down 9.2%), the UK (down 15.9%) and Poland (down 14.3%). Morocco said that it had imported 3.14 MMT of grains in the first seven months of 2014/15, which is 69% more than a year previously. That includes 1.2 MMT of wheat (excl durum), up from only 130 TMT in 2013/14. May 15 CBOT Wheat closed at $5.14, up 12 cents; May 15 KCBT Wheat closed at $5.55, up 15 3/4 cents; May 15 MGEX Wheat closed at $5.81, up 13 1/2 cents. 16/03/15 -- EU grains closed mostly higher, reversing early losses, after the US wheat market turned sharply higher in afternoon trade. 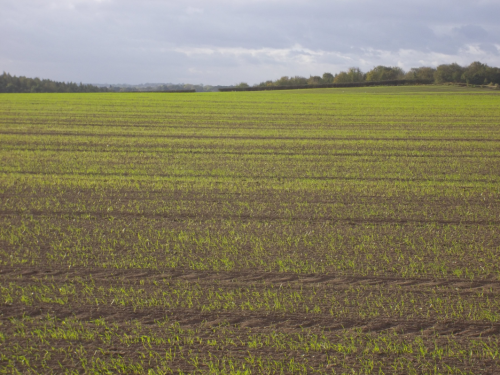 At the finish, Mar 15 London wheat was GBP1.1/tonne firmer at GBP118.95/tonne, May 15 Paris wheat was up EUR2.50/tonne at EUR192.75/tonne, Jun 15 Paris corn rose EUR0.75/tonne to EUR165.00/tonne and May 15 Paris rapeseed climbed EUR2.00/tonne higher to EUR371.00/tonne. Copa Cogeca estimated the EU-28 soft wheat crop in 2015 at 138.42 MMT, a fall of 6.5% versus a year ago. They see production in France virtually unchanged on last year at 37.4 MMT, but output will fall in many other countries with the exception of the Czech Republic (up 3.1% to 5.6 MMT) and Romania (up 2.3% to 7.57 MMT). Here in the UK, the 2015 wheat crop will fall 15.9% to less than 14 MMT, they predict. Germany will see it's output decline 9.2% to 25.16 MMT and Poland will witness a drop of 14.3% to 9.24 MMT. Spain's production will decline 1.2% to 5.63 MMT, but the biggest fall of all will come from Bulgaria, whose crop will tumble 38.5% to just 3.15 MMT, they estimate. Reduced plantings and lower anticipated yields are a recurring theme among those countries expected to see a decline in output this year. Joining in with the debate over how far, if at all, UK wheat plantings have fallen this year, Copa Cogeca estimate the planted area here at only 1.687 million hectares. That's broadly in line with the HGCA's England and Wales reckonings, but well below the figure of close on 2 million given by Origin Enterprises last week, and represents a year-on-year decline of 12.5%. UK yields will average 8.28 MT/ha this year, down nearly 4% from a year ago, Copa Cogeca forecast. For barley, they see the EU-28 crop down a hefty 18% to only 46.65 MMT, according to their official press release. This data appears incomplete however, as they give no figures for spring barley production in either France or the UK. The UK winter barley crop is forecast at just under 2.5 MMT versus a little over 3 MMT last year. For corn, Copa Cogeca estimate the EU-28 crop down 4.6% at 68.92 MMT. The soft wheat and corn estimates are in the ballpark of those released by Strategie Grains last week (140.4 MMT and 68.2 MMT respectively). The barley number however is massively different compared to the French analysts figure of 58.1 MMT, and maybe should be taken with a pinch of salt. 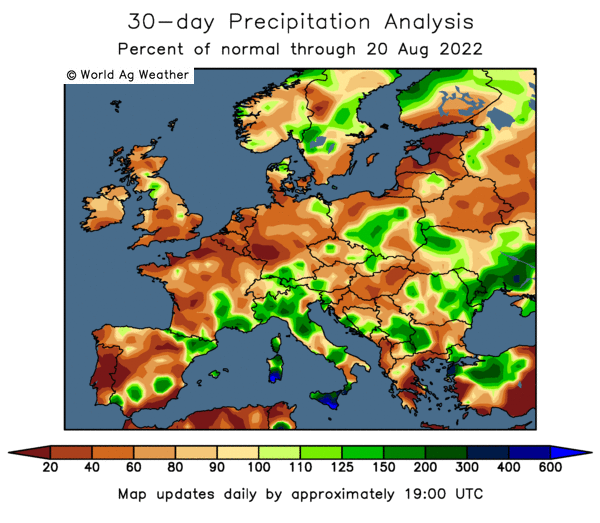 Copa Cogeca meanwhile estimate the EU-28 OSR crop to fall 6.9% to 21.95 MMT, a three year low, with a planted area down by 2.2% and yields dropping 4.8%. They see the French crop down slightly at 5.48 MMT, but see UK production falling 9.2% to 2.27 MMT and the German crop falling a hefty 15.3% to 6.22 MMT - even if they do still retain top spot in the EU production table. The sharp decline in EU rapeseed production expected this year is mainly as result of the neonicotinoid seed treatment ban, they said. The chairman of the oilseeds working party Arnaud Rousseau said that "the situation is very serious, with declines of up to 1 million tonnes in rapeseed production estimated in Germany...What makes it worse is that there are no alternative tools for crop protection for the spring varieties and crops are being destroyed by flea beetle attacks."